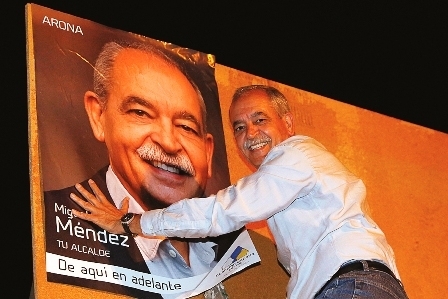 In the upcoming elections, the Coalición Canaria’s candidate for mayorship of Arona is Miguel Ángel Méndez. 22.05.2015 - If he wins, he intends to help the people – from the very youngest to the most mature members of the community - in areas such as employment, education, sports and tourism. Ángel Méndez has a commanding presence and portrays enthusiasm, renewed strength and a firm commitment to Arona. We asked Miguel Ángel about his background. He told us he came to live in Arona at the age of 11. He was originally an English teacher in Los Cristianos and Buzanada, and later he became the headmaster of a school in Cabo Blanco, before entering into politics. You have been Arona’s councillor for culture for some time. What motivates you? What do you intend to bring to Arona? What would you do to improve education? Produced with news.CMS in 0,0676 seconds.